The start of a new year is a great time to check out the latest projectors which are going to make an impact over the next few months. Whether you want to overhaul your home cinema experience or experiment with new ways to spruce up your living space, these are the machines that will make an impact in 2018. Affordable, efficient and surprisingly capable given its price, this projector from Viewsonic has received critical acclaim. It boasts a full 1080p resolution, a 3200 lumens rating and a lamp life of around 4000 hours. 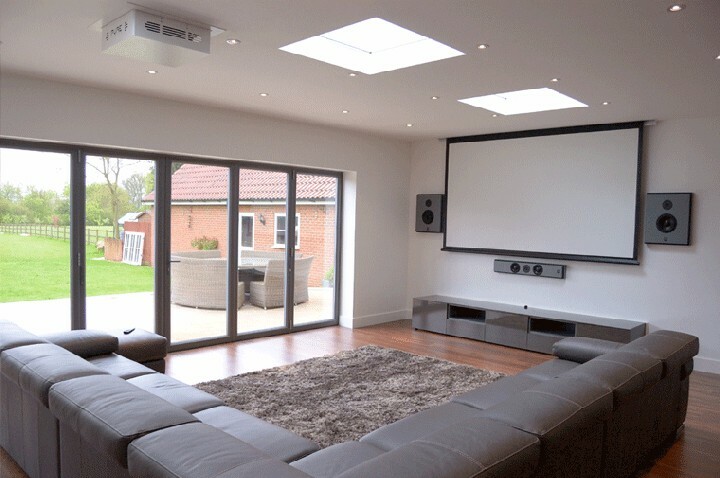 If your projector budget is hefty enough then this impressive Optoma model might be worth adding to your wish list. It supports 4K resolutions and HDR playback, while also handling content from lower resolution sources admirably well. The 2200 lumens lamp and the 1,200,000:1 contrast ratio claimed by the manufacturer make it a competitive performer at its price point. Making its debut at the Consumer Electronics Show 2018, this is LG’s first ever projector to offer 4K playback. It also stands out from the crowd thanks to its unusual design and its 2500 lumens output. The optimal screen size it can produce at this brightness is 150 inches and it even has built-in speakers to provide audio playback, making it fairly decent as a portable projector option. For some people 4K is not the be all and end all of projector tech. Other features may be more important. The CH100 fits this brief, with a 30,000 hour lamp life in eco mode, wireless connectivity for media streaming and a low-noise fan which means it does not sound like a hurricane when it heats up during use. This model is another CES launch and costs as much as the average family car. But its jaw-dropping specifications are more than enough to justify the asking price. It is an ultra-short throw projector that can blast 4K footage onto walls and screens while sitting just 9.6 inches away from the surface. It also comes with an impressive 360 degree audio setup and a gorgeous outer body that makes it look more like a piece of furniture than a projector. 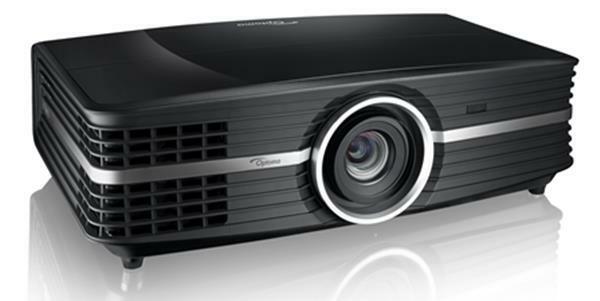 While this projector may not quite match the other Optoma model in the list in terms of raw performance, it does outdo it in other areas. Specifically, the integration with Amazon’s popular Alexa voice controlled assistant is a really nice touch. 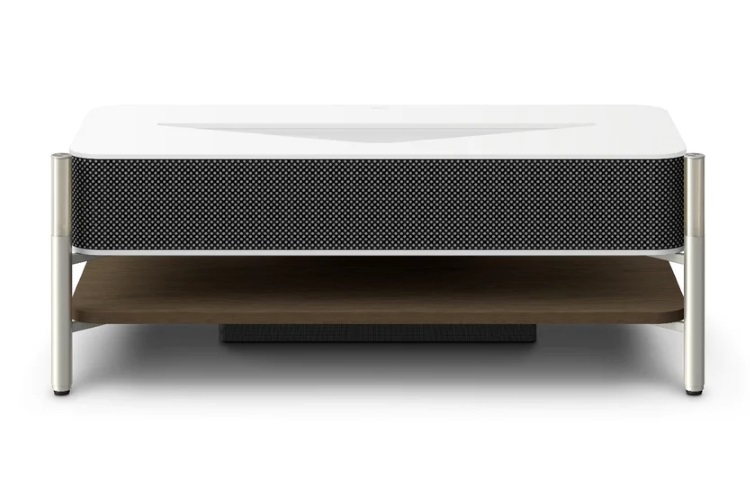 This lets users control it with voice commands given to the Echo or Echo Dot smart speakers. The on board 4K chip is just the icing on the cake. This projector is designed to bring 4K to the masses, undercutting many of its rivals with a comparatively affordable asking price and a decent set of features. This is achieved thanks to some clever technical trickery which means that the sub-4K chip can actually hit higher resolutions without having a prohibitive price tag included. A projector might not be the first item on many people’s checklists for a camping trip, but a good quality portable model can be a great way to provide entertainment for those long evenings when you may have forgotten your playing cards or when you need to stay inside due to rainy weather. Simply hook up your smart phone and you can project your favorite movies and TV shows using a larger image to provide viewing for more than one person at a time. 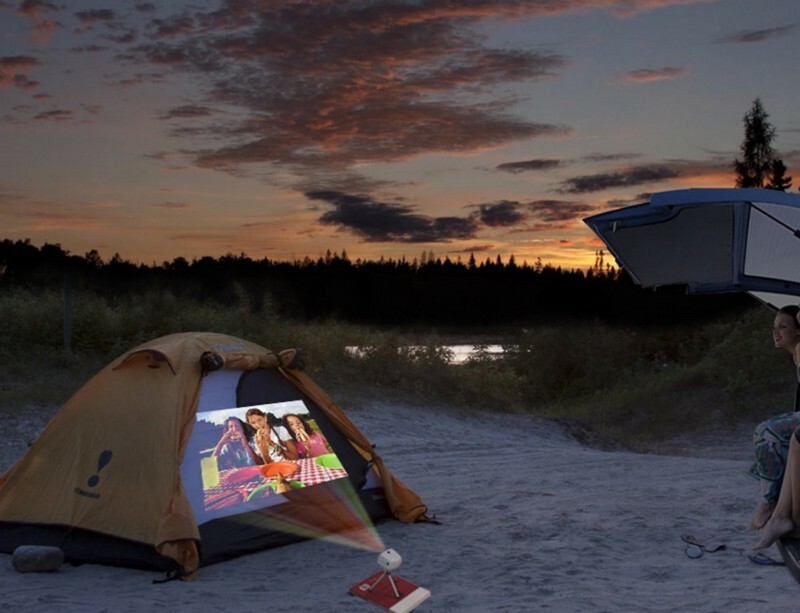 Of course, you need to make sure you’ve got the right model, because the last thing you need on a camping trip is to be carrying around a big heavy projector that you may not be able to provide the proper connections for. You might have to do your research to find one that fits your requirements and won’t be more trouble than it’s worth. One of the smallest and lightest projectors out there, it more than lives up to its ‘pocket’ name, and won’t cause you any problems when it comes to packing for your camping trip. With that size, you of course are trading in some of the power, so it only comes with 100 lumens of brightness and a resolution of 854×480, There’s also no batteries, so it needs to be connected to a power source. However, if you’re looking for portable, THIS is portable. Another projector that might not be quite as small as the Philips model but is still more than portable enough to be great for camping trips, this AAXA device is compact and comes with its own carrying case, while it also has a rechargeable battery. What it does lack is higher image quality on videos, but on a camping trip you’re likely to be more forgiving this odd issue, and its portability and durability are high selling points. If the AAXA model’s video issues are a significant problem for you, then you might want to consider this Magnasonic projector instead. It’s small, portable and very affordable too. At just 25 lumens of brightness, it doesn’t deliver great power, but its video quality is surprisingly good, as long as you’re able to watch your shows and movies in a dark space. It comes with a rechargeable battery and would be a great addition to any camping kit. MyProjectorLamps.com is your top source for projector lamps. If you’re in the process of purchasing a new portable projector, make sure to bookmark us for when the time comes to replace your lamps. In the meantime, happy viewing! Acer launched the line of X1 series projectors more than a half-decade ago, and in that time, we’ve seen a number of capable, durable and low-cost options. The X1 series is primarily Acer’s entry-level, ultra-budget set, with current iterations like the X113PH and X123PH starting at $299 and $399 respectively. The Acer X1140 is now out-of-production. 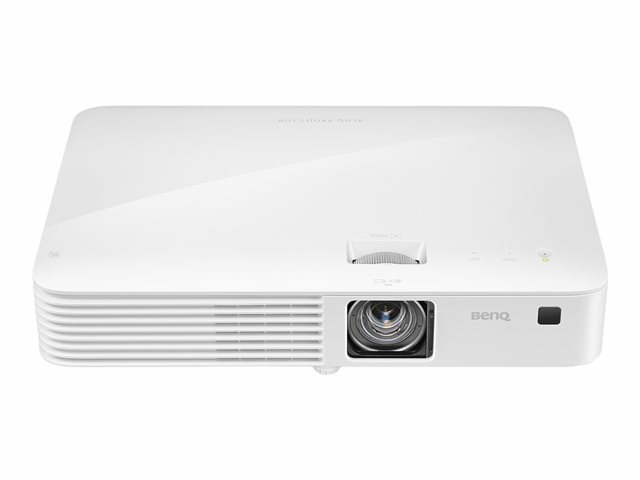 Yet, it shares a lot of commonalities with today’s X1 series projectors, including high contrast, powerful color technology and 3D capabilities. The biggest disadvantage to buying a used X1140 is price. With the similar X113PH starting at $299, it makes sense to buy new. If you can find it for right around $125, used or refurbished, it might be worth the investment, but if you’ve got the money, you might as well go with the newer X1 models. Bright Image, Low Resolution: Many Acer X1 series projectors have a native SVGA resolution (800×600). That makes them great for data images – i.e. PowerPoint presentations and classroom multimedia – but when projecting TV, films and most games, you’ll notice the lower quality image resolution. To be fair, the X1140 isn’t designed to do that, and for classroom video clips and film viewing, the output is sufficient. 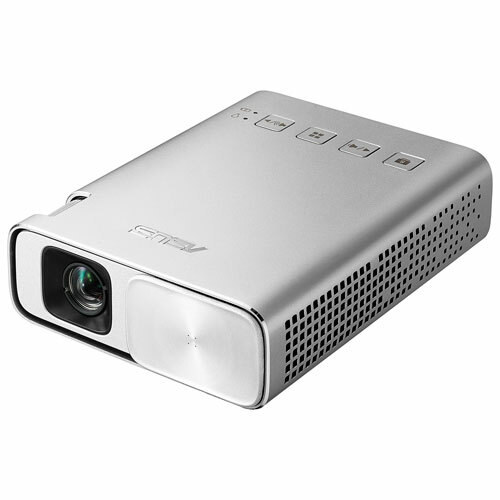 Fortunately, the DLP-based projector provides a bright 2,700-lumen image, which is suitable for classroom spaces, but may require the lights to be dimmed. Great Contrast: With a contrast rating of 10,000:1, the X1140 delivers clear and crisp images. This is especially important in the classroom and for business presentations. White-on-black text is crisp and clear, and the X1140 provides rich, dark black levels, as well as great image quality for text-over-picture. 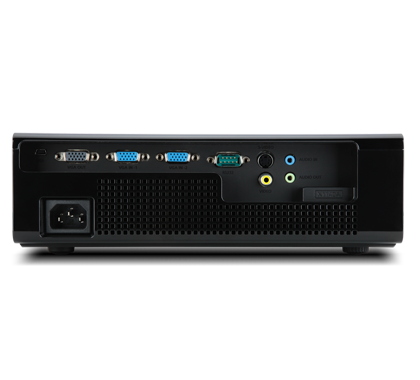 A Fair Amount of Connections: As primarily a presentation tool, the X1140 is somewhat limited in the number of devices that can be connected to it. There are a trio of VGA ports, a mini USB port for software updates, and S-video ports. Today, HDMI and USB connectivity are standards. The current Acer X113PH, for example, includes HDMI outlets and USB A and B ports. Basic Speaker System: Compared to other entry-level projectors, the X1140 is equipped with a pretty basic speaker system. It’s just a 2-watt set-up, which provides fairly limited output. For noisier environments, an external audio system would be the best option. DLP 3D Capabilities: The X1140 can project 3D images from a laptop. This is useful for interactive multimedia presentations, and it’s not always a common feature for ultra-budget projectors. Installation Flexibility: With Keystone correction, a lens zoom ratio of 1.1:1, and a top loading design, the X1140 provides a bit of flexibility in where it can be ceiling mounted. The top loading design is particularly useful, as it enables replacement lamps to be installed without removing the projector from its mount. Overall, the X1140 is very similar to today’s Acer X1 series entry-level offerings. Yet, the X123PH does feature some updated and enhanced technology, including boosted contrast, a better array of connections, and an updated economy mode that delivers up to 10,000 hours of lamp life. Better yet, the price is extremely low at $299. Thus, it’s difficult to justify purchasing a used or refurbished X1140 – opt for the newer version instead. 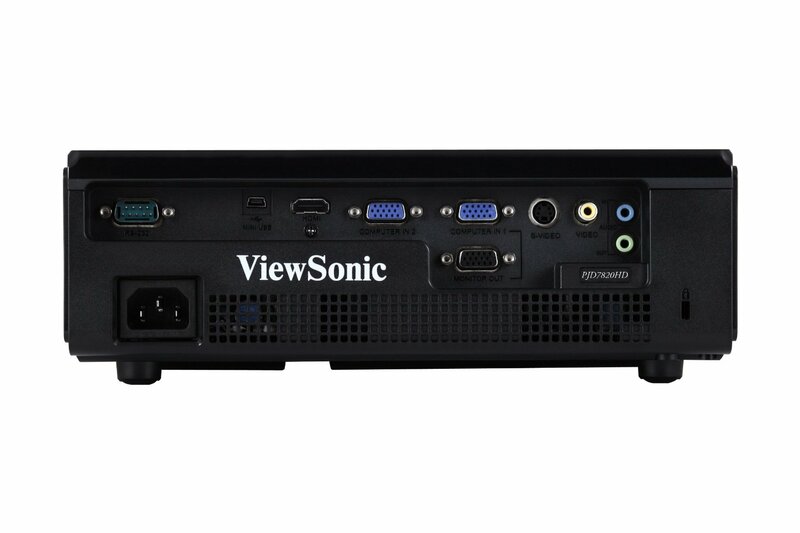 Released two years ago, the ViewSonic PJD7820HD is a solid performer in the budget data projector class. 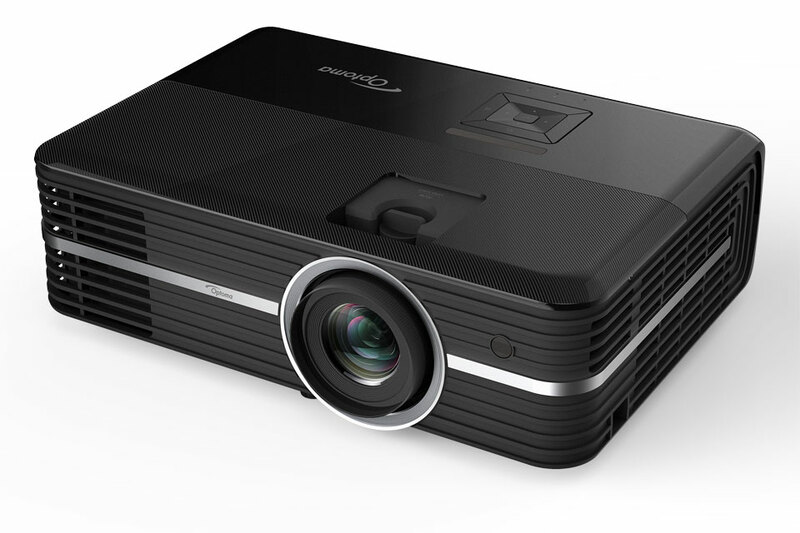 The projector’s Full HD resolution (1920×1080) delivers crisp, detailed data images. Text, both small and large, is clear, and it’s capable of handling multimedia. Yet, it’s not the most reliable cross-over projector – it’s an excellent data projector, but just OK with home entertainment. 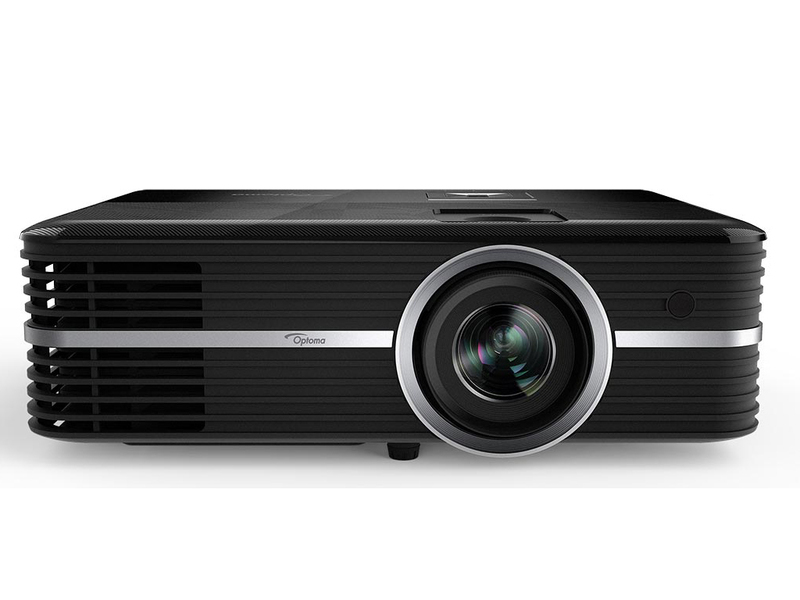 Initial reviews of the ViewSonic PJD7820HD revealed that the projector’s video performance was average. Color performance is decent, with some rainbow artifacts present. It can handle video, gaming and 3D content, but it’s not perfect. This is more of an entry-level home entertainment projector, which makes sense considering the price. 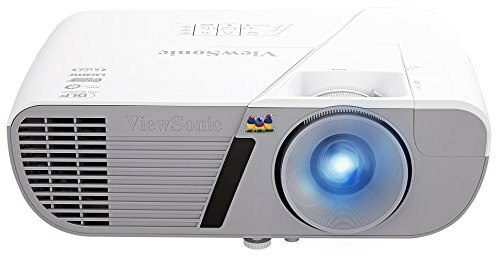 On the other hand, as a data projector, the ViewSonic performs well, and with a starting price of $599, it’s one of the most affordable Full HD presentation projectors on the market. 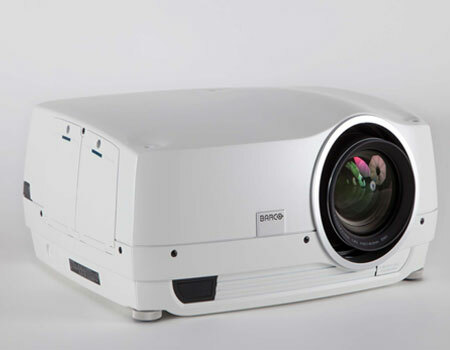 Extended Lamp Life: In standard mode, this single-chip DLP projector achieves 4,000 hours of lamp life – above-average in terms of performance. In smart economy mode, though, the lamp life is boosted to 7,000 hours. Plus, with the PJD7820HD replacement lamp and module – part no. 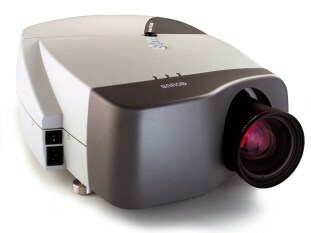 RLC-079 – costing $274.99, maintenance costs for this projector remain low. 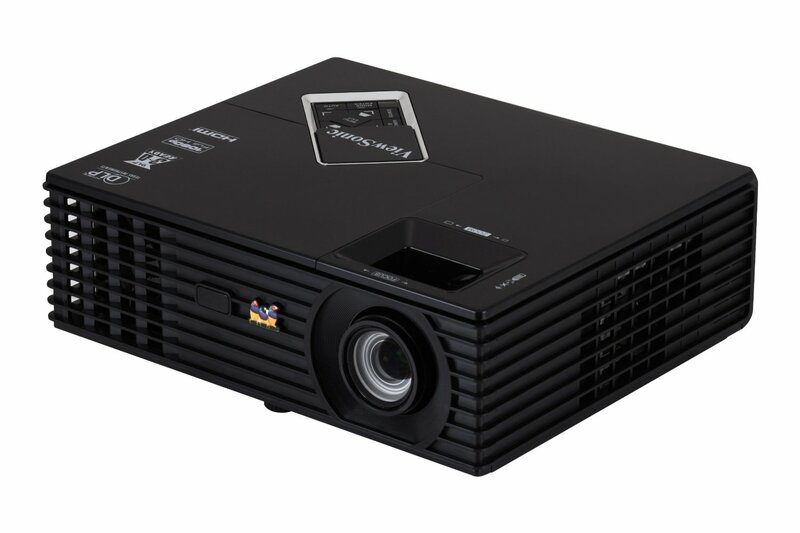 Image Brightness: When it was released, the PJD7820 was one of the brightest Full HD data projectors available. The lamp is rated at 3,000 lumens of brightness, which suits well to small- to mid-sized spaces and moderate levels of ambient light. Native Resolution: Not only was the PJD7820 one of the first Full HD (1920×1080) data projectors, it was also one of the most affordable. With a Full HD resolution, it’s nearly double the WXGA format and nearly three times more resolute than XGA projectors. That makes it possible to draw out better contrast for small images. With XGA, smaller text becomes more difficult to read; that’s not the case with Full HD. 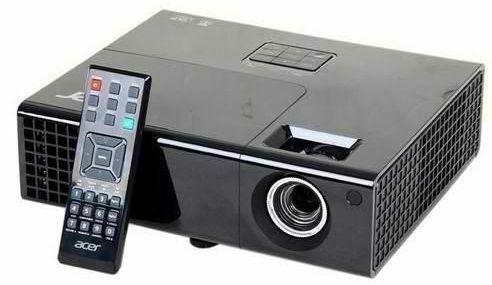 Portability: The projector weighs just about four pounds, and its dimensions (3.3×10.6×8.7) make this an extremely portable projector. Thus, it’s ideal for presentations on the go, as well as for moving between venues, i.e. office and home. Color Performance: One disadvantage is the color performance. It performs about average, with some calibration, but yet, rainbow artifacts are present, particularly with video. This isn’t one of the better projectors for video, and that’s why, if you need only a home entertainment projector, you might want something that provides better color quality and saturation. Connectivity: There are a range of ports, including an HDMI, USB Type B, S-Video, VGA monitor out, and two VGA-in ports. The HDMI, which supports HDMI 1.4a, enables the projector to connect directly to a Bluray player. One disadvantage, particularly for business presentations, is that it doesn’t have a Type A USB port, which make it possible for the projector to read data directly from the USB port. The Type B port only accommodates a wireless mouse and similar applications. Audio Performance: The projector is equipped with a 2-watt speaker; that’s below average in terms of performance, with similarly priced projectors available with 10-watt speakers. 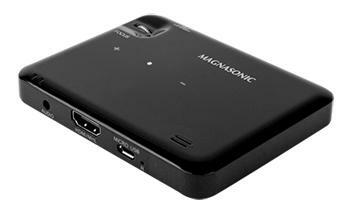 Yet, the audio is capable, ideal for small rooms or if your audience will be sitting near the projector. The Bottom Line: Is the ViewSonic PJD7820HD Worth the Investment? As a data projector, there’s a lot to like about the PJD7820 – most importantly though is the price. 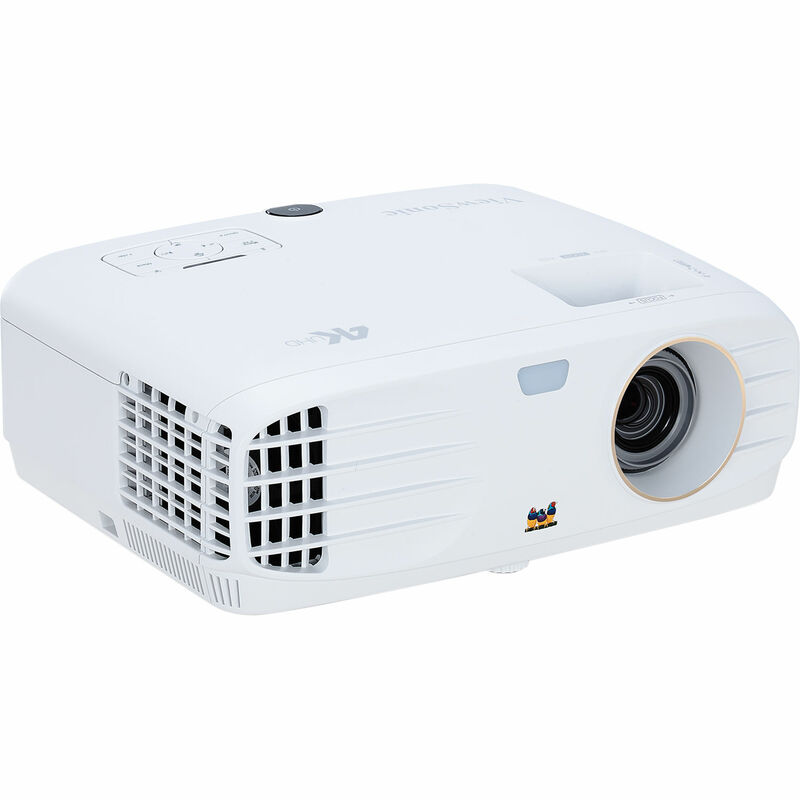 When it was released it was one of the – if not the most – affordable Full HD data projector available. These days, there are similarly priced options, but yet at $599, the PJD7820 is a very good value. Plus, data image quality is crisp, it can accommodate a number of different sources, and it’s lightweight and portable. At that price, you can’t go wrong for data projection. WXGA projectors are similarly priced, but the images aren’t as resolute. So this is a suitable piece of hardware for the office. 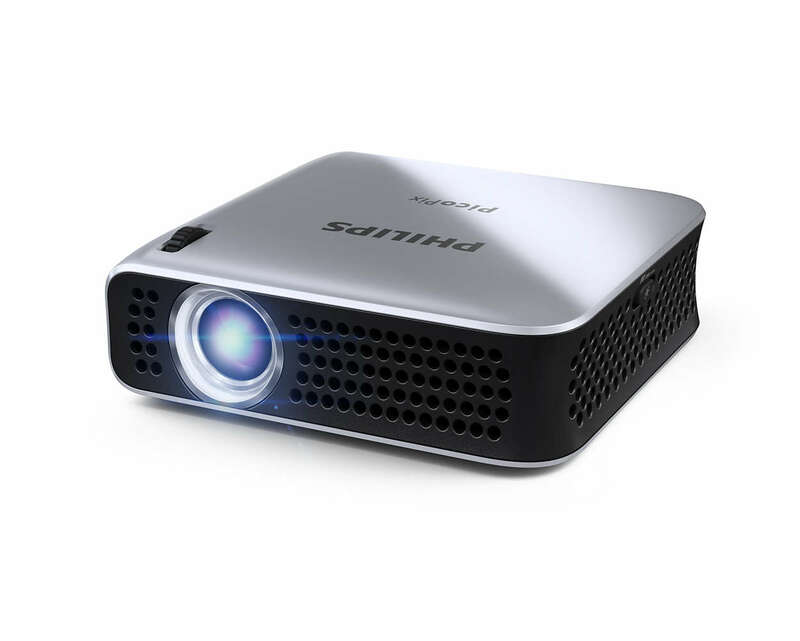 At home, video performance is just OK, so if you’ll be using this more for home entertainment, it might be wise to invest in a projector with a more robust video feature set.